Where Is It: This Park isn’t hard to find, but it is hard to know if you’re in it or not. Three state parks are co-managed with the National Park, and the public land is adjacent to private land … and a significant public highway, California 101, is the main road traveling through the park. When we first visited, I missed the visitor’s centers. I’ve shown some signage clues for you, below. The parks stretch from about 25 miles north of Eureka, CA to within about 15 miles of the Oregon border. It’s about 300 miles north of San Francisco and 330 miles south of Portland. The Birth: In 1964, President Johnson asked Secretary of the Interior Stewart L. Udall to prepare a report on the need and feasibility for creating a National Park dedicated to preserving redwood trees. At the time, less that 2.5% of all virgin redwood forests were preserved, and it was estimated that the rest of the forest would be cleared by the year 2000. When logging companies were asked to cease logging in the areas projected to be a part of the National Park, they refused. After years of consensus building, President Johnson signed the bill creating this park on October 2, 1968. 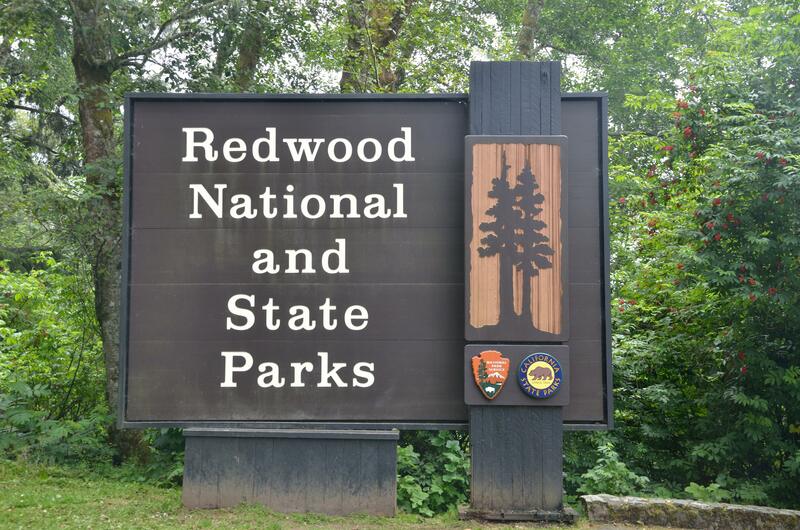 At the time of its creation, the Park included 10,900 acres of old growth redwood forest … together with the 50,000 acres already preserved in the adjacent State Parks. It Happened Here: The Endor scenes from Star Wars Episode VI: Return of the Jedi were filmed here. Yes, Ewoks live among the redwoods. # Visitors: 352,517 in 2012. May had the lowest attendance; July had the highest. It’s the 142nd ranked attraction according to visitation in the National Park Service’s universe. Plants: Redwoods can live to be 1800 years old or more, and can top 300′. Redwoods are the tallest trees on the planet. The tallest known redwood is called Hyperion, and was found to be 379.1′ tall when it was first discovered in 2006. Hyperion is in a remote part of the park, and its location is not widely publicized in an effort to protect it from ne’er-do-wells. Animals: Threatened animal species protected by this park include the brown pelican, tidewater goby, chinook salmon, northern spotted owl and Stellar’s sea lion. In March, you can watch migrating whales from the shoreline of the Park. Choices: You can drive the park north to south or south to north. It’s a meandering kind of experience. Some sights are right off of the main highway; others you need to go exploring to find. It’s important to have at least some wanderlust when you visit the park, because if you simply drive on the main highway you’ll miss it. There are 4 visitor’s centers. We missed the southern-most one near Orick on our way north (see the horrible signage below). We then did visit the main office and northern-most visitor’s center in Crescent City … and that unique building, straddling a street in the city, looked nothing like I expected the visitor’s center to look like. Here’s an article on that bit of odd. We eventually did visit the southern-most visitor’s center, called the Thomas H. Kuchel Visitor’s Center. It’s not visible from the highway. The signage is pictured below in the hopes it will help you find it, if you are driving north from San Francisco on your way to the park, as we were. Fees: None. Yes, it’s all free! Staying There: Camp sites are available in the state parks and nearby National Forest. Redwood Hostel offers lodging within Redwood National and State Parks. Primitive camping while backpacking is available in the National Park. In 1978 Congress added 48,000 acres to the national park’s 58,000 acres, including about 36,000 that had been logged. The raw, clear-cut land, a park official wrote, had “the look of an active war zone.” Today, in an epic earth-moving project—a redwood renaissance—crews are beginning to reclaim vast stretches of logged-over lands. Hillsides, carved away for logging roads, are being restored. Most of the 400 miles of roads are being erased. It will take at least 50 years for the scars of logging to disappear and another 250 or so years for the replanted redwood seedlings to grow to modest size. Lady Bird Johnson Grove is a spectacular, easy access loop trail in the southern part of the park. It’s a definite must see, and just about everybody will be able to do the easy 1 mile hike. Fern Canyon was featured in Jurassic Park II. It’s a one mile chasm near the beach with 50′ walls carpeted with ferns and moss. Elk Meadow is a picnic area with trailheads; it’s one of the best places to see a herd of Roosevelt Elk. This is the first sign pointing you towards the southern visitor’s center. Sign # 2. TURN NOW! Off the main road, this is the sign directing you to the visitor’s center. THIS is the entrance sign to the visitor’s center.